Every now and then we will be giving you a chance to get to know our local, Downtown business owners – your friends and neighbors – who make Downtown such a special place. We’d like to introduce you to Debora Beck, owner of Willow Creek, located at 411 Main Street. Debora Beck, formally Debora Branson, of Willow Creek was born in 1965 in Corvallis, Oregon. At the time, her father was involved in the firefighting and forestry community in the north western region of the United States. After nine short months following her birth, her father relocated their family to Western Colorado where he himself was born and raised. They spent three years in Gunnison, Colorado before finally relocating to Grand Junction, Colorado where Debora spent most of her formative years growing up. Though she was not born here, she has more roots than most in the local culture and community than those who can say they were. The Branson family name runs deep in the history of Mesa County and is one of several family names, such as the Yorks and Walcks, that have seen the Grand Valley though generations of growth and development. Her grandparents were in the sticky business of harvesting honey and at one time operated their very own business out of the peculiarly shaped igloo-esque building on Patterson Rd. that sits in front of Sanders Hydraulics. In addition to their bee wrangling, her grandparents also owned Branson’s Drive-Inn, located just outside of Collbran, Colorado. Naturally, Western Colorado was more like home than anywhere she’d ever been. Debora went on to graduate from Grand Junction High School. Following, she pursued a degree in Accounting and Preforming Arts at Denver Metro University only to later return home to continue her studies at Colorado Mesa University (then Mesa State College). Disillusioned with school, she decided to take a step back from her studies to direct her attention toward one of her greater passions- Herbalism. At sixteen-years-old, Debora was in a serious car accident that resulted in a severe head injury. Unbeknownst to her at the time, this seemingly tragic happening gave life to the very passion that has carried her all these years. After the glass was swept from the road and the stiches were carefully knotted, she was instructed to take a regimen of pharmaceutical medications to ensure her recovery. Being the inquisitive young woman she was, she studied the medications she was prescribed to find the potential side-effects to be particularly alarming. Enough so that she became curious about healthier natural alternatives. After all, with having a considerable amount of Native American blood running through her veins, it was only natural to inquire. What started out as a tragedy quickly developed into a passion for mother nature’s natural medicine. With college in her rearview mirror, Debora was able to focus more on expanding on her interest in Herbalism. Being the practical woman she is, she knew she would still need to earn a check to support her passion. Not long after her decision to leave Mesa State College, she packed up and headed east to Denver, CO where she acquired a license in Real Estate Appraisal in 1989. For almost 10 years she worked on growing her network in the herb community all the while appraising properties all over the Eastern Slope. In 1998, a yearning heart and a young man she met at a traditional pow-wow carried her heart and life to the Bay area of California where she continued to expand her horizons as a practicing herbalist as well as appraiser. Ten years and one son later, Debora found herself back in the warm embrace of Grand Junction in 2008. She started a new job working for Orr’s Trading on Main St. where she worked for 5 years up until their doors closed in 2013. After spending an immense amount of time immersed in the Main St. community, she knew she wouldn’t be able to walk away as easily as her previous employer. She already had established a strong network of distributors and colleagues over the years as well as had a good relationship with the landlord of the soon-to-be vacant building she spent the last 5 years in. All she needed was the good grace from her would-be landlord and community support. All of which came to fruition with out too much trying. Debora has been a fixture in the Main St. community for the last 10 years, 5 of which she has operated her own business, Willow Creek. 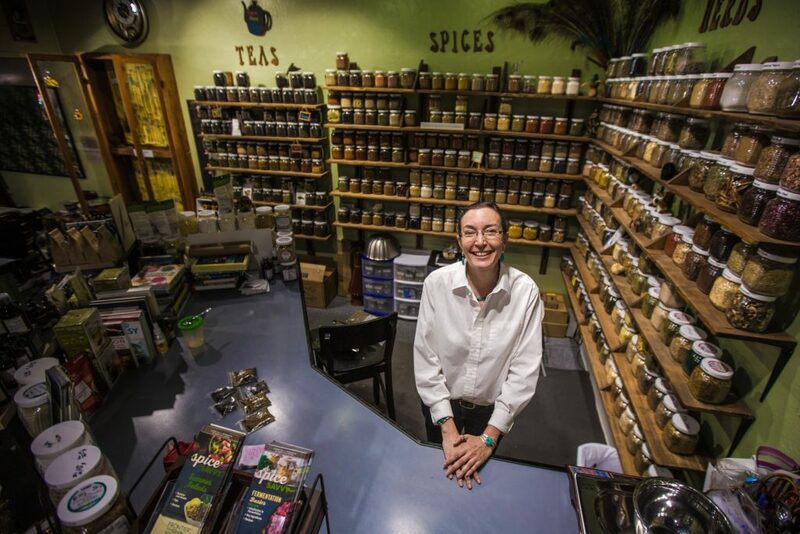 Her shop boasts over 170 herbs and spices that she turns in to robust teas as well as mouthwatering seasonings. The walls are littered with works of art from local artists and the shelves that don’t have spices and herbs sport a variety of local products. Despite bring a small store, she moves enough inventory to replenish her stock with fresh herbs every two weeks.